The “Bikes on the Beat” initiative is back, according to the Boston Inspectional Services Department. Last month, Code Enforcement Officers attended a three-day bike training course at the Boston Police Training Facility. Those who completed the course are now certified in instruction of bike usage, bike safety as well as bike safety precautions, including eye protection, gloves, knee pads, helmets and other protective measures. According to the City of Boston, these officers will be hitting densely populated Boston areas, including Downtown Boston, the South End, Beacon Hill and Back Bay, on their city bikes. The purpose is to help to ensure a quick and timely response to emergency calls in these densely populated areas. These bicycling officers will be able to cut through the congested areas at a high-rate of speed and will help to increase the visibility of our area’s law enforcement. 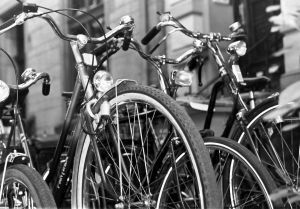 Our Boston personal injury attorneys understand that these officers won’t be the only two-wheeled travelers on our roadways. During this time of year, the bike and on-foot traffic is plentiful. Travelers of all kinds are urged to be cautious out there. It’s these travelers that are most likely to be seriously injured or killed in the event of a traffic accident. We all need to work together to help to preserve the safety of our streets. “This is a great program that will connect my staff with the general public on a daily basis,” said Mayor Menino. With the increase in bicyclist traffic in the area during this time of the year, we also see an increase in the risks for these kinds of accidents. Oftentimes, these travelers are overlooked on our roadways and accidents result. Drivers are asked to be cautious and aware of their surroundings while traveling along our congested roadways. Your responsible driving habits can help to keep our residents and visitors safe. According to the most recent statistics from the National Highway Traffic Safety Administration (NHTSA), there were nearly 620 bicyclists killed in traffic accidents in the U.S. in 2010. To make matters even worse, there were another 52,000 of these vulnerable riders injured in these same incidents. -Never travel in a bike lane. -Always look around for passing bicyclists before you open the door to your vehicle. -Be sure to pass bicyclists slowly. -Make sure you allow bicyclists with at least 4 feet of space when passing. -Always use your turn signals. Make your maneuvers as predictable as possible. -Always check your mirrors and your blind spots, especially before making a move in traffic. -Allow bicyclists the entire lane if necessary. -Don’t get distracted by using your cell phone. If you or a loved one has been injured in an accident, contact the Law Offices of Jeffrey S. Glassman, LLC for a free and confidential consultation to discuss your case. Call 1-877-617-5333.